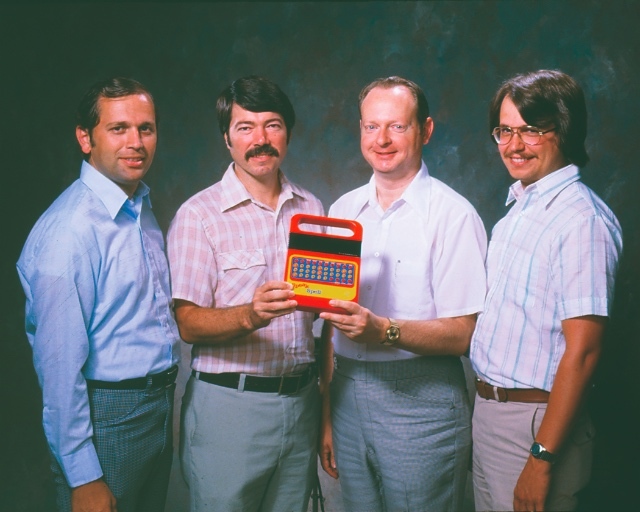 The Speak & Spell – one of the most iconic toys of the 1980s – is a teaching machine. By that, I don’t mean simply that it’s an electronic, educational device. It is that, sure. 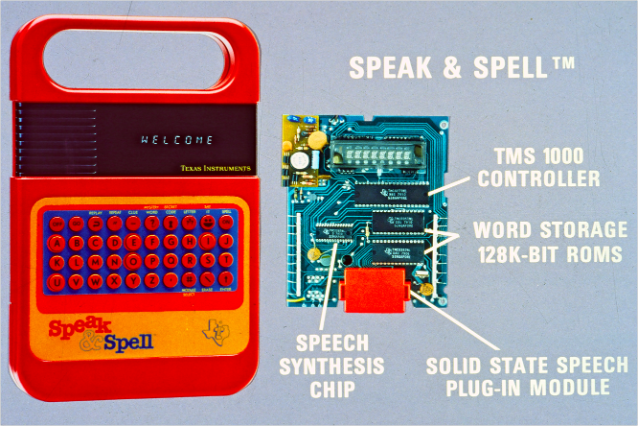 The Speak & Spell is a teaching machine specifically in the tradition of B. F. Skinner, reflecting some of both Skinner’s design principles and his theories of learning, decades older than the popular Texas Instruments device. Rather than selecting the correctly-spelled word in a multiple choice quiz, for the example, the Speak & Spell prompts the user to construct the response. It praises; it corrects. Like so much of education technology, the Speak & Spell takes a behaviorist approach to teaching and learning. That’s noteworthy, because I would argue that the Speak & Spell has profoundly shaped how we think about electronic educational devices – what we expect these devices to do. In 1967, engineers at Texas Instruments developed the first handheld electronic calculator. Thanks to a number of technical developments (single chip microcomputers, LED and LCD, for example), these portable computing devices quickly got better and cheaper. In the early 1970s, calculators could cost several hundred dollars, but by the end of the decade, the price had come down to make them more affordable and more commonplace. And so, with some resistance and debate about their effect on learning, calculators began to enter the classroom. A new ed-tech market. 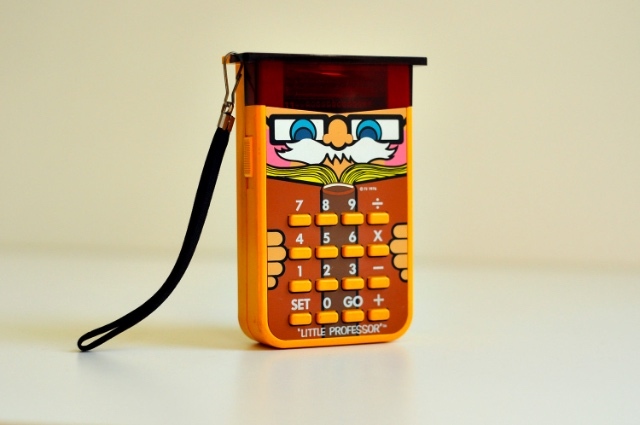 In 1976, Texas Instruments introduced what it boasts was “the first electronic educational toy”: the Little Professor. It functioned as a handheld drill-and-practice aid for basic math, and was designed to resemble a wise and friendly owl. The Little Professor suggested problems to students and rewarded them with a message on its display when they gave the correct answer. Little Professor was priced to sell for under $20 and was an instant hit. Although production was ramped up, TI couldn’t make enough units to fill the orders for the Christmas season in 1976. Demand for 1977 was more than 1 million units. The success of the Little Professor prompted Texas Instruments to brainstorm other possible electronic learning products. It was Texas Instruments engineer Paul Breedlove who reportedly came up with the idea of a learning aid for spelling. (Interestingly, one of the very first patents for educational devices was awarded in 1866: “an apparatus for teaching spelling.”) Breedlove’s idea was to build upon bubble memory, another TI research effort, and as such it involved an impressive technical challenge: the device should be able to speak the spelling word out loud. Research began in 1976 – a three-month feasibility study with a $25,000 budget and a team of four: Paul Breedlove, Richard Wiggins, Larry Brantingham, and Gene Frantz. Initially, there were only a very few people involved. At the initial meeting in November, Paul Breedlove came over to the research Labs with Gene Frantz and Larry Brantingham from the Consumer Products Group. The result of that meeting was that I was to propose a technique for generating the speech in the product. The challenge was that it had to be solid state (no pull strings! ), cheap (meaning it used a low cost semiconductor technology), and the speech had to be good enough so that the user could understand the word out of context — a little bit harder than using a word in a sentence. Larry was a circuit designer and was tasked to determine if what I came up with could be implemented in an integrated circuit. Larry and I spent time together discussing various strategies, and Gene Frantz, who eventually became the project manager, kept the overall design moving forward. The Speak & Spell was not the first talking toy. But it was, as Texas Instruments boasted in its CES press release, the first with “no moving parts.” Other toys, such as Mattel’s Chatty Cathy, used pre-recorded voices on phonograph or tape, typically triggered by a pull-string or similar mechanism. These broke easily, as any parent would tell you. So “no moving parts” was a selling point for durability. But to accomplish that with the Speak & Spell, Texas Instruments had to make an important engineering breakthrough in speech technology. I promoted the choice of linear predictive coding to generate the speech signal from a small amount of data. Today, the speech could easily be recorded and stored in large digital memory chips. But in 1976, memory chips were not capable of storing that much data. We considered generating the speech from phonemes or sound fragments but the speech quality was not sufficient. A digital filter could be used and the time varying coefficients could be stored in memory but the amount of computations involved seemed too great. The Speak & Spell was one of a trio of talking educational toys released by Texas Instruments that later included Speak & Read and Speak & Math (both launched in 1980). Speak & Spell was incredibly popular and was sold around the world, with cartridges that offered localized versions of games and word libraries in both different accents (British English versus American English, for example) and languages (Japanese, Italian, French, Spanish, and German). But does the Speak & Spell teach? These aren’t uncommon findings, of course. Much of ed-tech is similarly ineffective. Yet the Speak & Spell has become one of the most iconic pieces of education technology, referenced again and again in pop culture. The device appeared in Toy Story and Toy Story 2 and, most famously, in E.T. the Extra-Terrestrial. E.T. used the Speak & Spell to “phone home,” but it doesn’t actually teach spelling. But E.T. 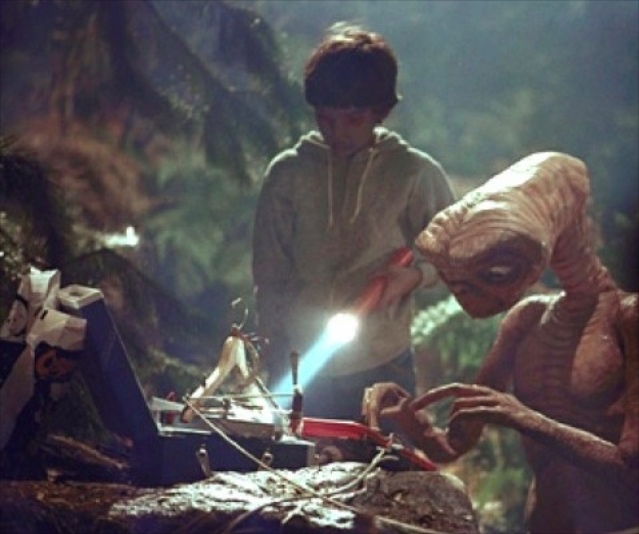 used it to “phone home.” And that’s why, despite the model upon which the instruction was designed and despite the lack of research to demonstrate it was truly an effective spelling aid, the Speak & Spell manages to break free of behaviorist teaching machines – because as E.T. demonstrated, the Speak & Spell is eminently hackable. It can be dismantled and reprogrammed to do different things, to serve different purposes. “So, if the Speak & Spell was saying ‘Spell the word PONY’ and you activate the ‘hold’ effect in the middle of ‘PONY’, it would sound like…..‘Spell the word POOOOOOOOOOONY’.” All of this has made the Speak & Spell a stock “instrument” in a lot of noise music. Contrary to how many electronic devices are "closed" and constrained by design, Texas Instruments did not restrict usage of the various language cartridges by region. And the company has not responded negatively to those who “circuit bend” (or show others how to “circuit bend.”) That approach differs, it’s worth noting, from the one that TI took to lock down some of its other computing devices. In 2009, Texas Instruments filed a DMCA takedown request against programmers who’d posted instructions on how to “flash” a new operating system onto Texas Instrument’s TI–83 series graphic calculator; that is, a way to make its devices programmable beyond the TI software. The Speak & Spell – its software and its hardware – remains (somewhat) “open.” That makes this particular device very different from much of current education technology – tools that are not hackable, not extensible, not inspectable; tools that even if you buy, you don’t really “own” or control.